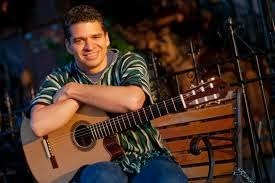 Guitarist Freddie Bryant has released a new album that is as much a celebration of his fine guitar virtuosity as it is a dedication to his Mother, the great operatic soprano Beatrice Rippy Hollister, who passed away in 2012. A picture of Bryant’s parents grace the inside sleeve of the album in soft sepia tone. Mrs. Hollister toured around the world with her husband the pianist Carroll Hollister before dedicating her life to education at the Third Street Music Settlement, the Henry Street Music Settlement and the Harlem School of the Arts. She was known for her effortless lyricism in such memorable performances as Serena in a touring production of Gershwin’s Porgy and Bess, as Mimi in La Boheme and as Nedda in I Pagliacci. With such a formidable musical legacy it is no wonder that the apple has not fallen far from the tree. with a style that blurs the lines of classical, Flamenco, Brazilian, Middle Eastern music, blues and jazz. 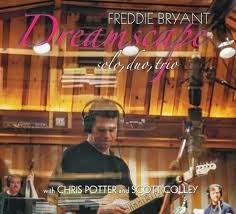 Joined by the impeccable talents of multi-reedist Chris Potter and bassist Scott Coley, Bryant opens the album with his evocative composition “Dreamscape.” The song features a finger-picked twelve-string vamp over which Potter plays the most gorgeously light soprano solo musings that I’ve heard in a long time. Bryant overdubs a probing electric guitar solo as Colley lays down big plump bass lines in deft accompaniment. On “Vignette #1” bassist Colley finds simpatico with Bryant’s sensitive nylon guitar work, using both arco and pizzicato techniques in this Bryant composition, a song reminiscent of the work Pat Metheny did with bassist Charlie Haden on Missouri Sky. “Vignette #2” is a more upbeat duo with Colley, with Bryant on electric guitar. The two trade rapidly developing musical ideas while maintaining an inherent swing. The trio re-enters on Bryant’s “Songs” with Potter taking up the bellowing tones of the bass clarinet and Bryant on arch top guitar. The composition leads off with a blues-based riff that then morphs into a hymn-based melody that could easily be heard as part of a Sunday service. Potter explores the timbres of the woody bass clarinet on his heartfelt solo, as Bryant and Colley provide the subtle rhythmic core upon which he builds. Bryant and Potter work as a duo on the traditional spiritual “I’m Going to Tell God All My Troubles.” Potter continues with the bass clarinet for this heartfelt rendition arranged by Bryant. Bryant employs the soft sensitive sound of his nylon string guitar to play a nuanced rhythm, over which Potter plays a stirring solo. Potter’s work is warm and reverent, showing just how soulful this usually powerhouse of a player can be when given inspired material. This is an emotionally charged song for Bryant, as the same song is rendered by Bryant’s mother and father from their 1974 appearance at Alice Tully Hall as the closing track of the album. The trio takes on Bryant’s shifting “Every Day is the End and the Beginning of Life Beautiful…” which features Potter on his more familiar driving tenor and Bryant on electric guitar. The group negotiates the changes with precision and aplomb. Despite the brilliant interplay throughout the album it is Bryant’s solo work that showcases the artist’s prodigious talent. Bryant’s solo guitar is inventive and pristine on such classic songs like Monk’s “Ask Me Now” and Mingus’s “Goodbye Pork Pie Hat.” The guitarist demonstrates his affinity for the self-accompanied solo guitar genre most identified with the great Joe Pass’s album Virtuoso from 1973. In many respects this is Bryant’s virtuoso performance. His styles are diverse and accomplished. He explores a Flamenco style on Bruno Martino’s “Estate” and on Sammy Fain’s “Secret Love” Bryant employs loops to play against himself. On his own composition “Serenade” Bryant’s nylon strings ring with warmth and sensitivity as he demonstrates his ability to accompany himself with a vibrato lead that hovers over his rhythm like a hummingbird’s wing’s over a flower. Bryant shows his funkier side on Herbie Hancock’s “Watermelon Man,” but this man’s strength is in lyricism and beauty. “Fantasia on a Theme by Charlie Haden for Turiya” and Haden’s “Silence” are beautifully rendered in a Spanish style that is evocative of red-tiled roofs and stucco walled haciendas. Dreamscape is a celebration of virtuosity and lyricism as well as a dedication to the spirit of a mother’s musicality, from a son who was inspired to find his own musical voice. Drummer Matt Wilson Summoning All Parties to His "Gathering Call"
In music and especially contemporary improvised music, the role of the drummer has greatly expanded beyond the traditional role of a simple keeper of time. Witness the current crop of albums that have recently been released by drummers who have taken on the role of leader and oftentimes composer; albums that demonstrate just how diverse and I might add exciting the art of contemporary drumming has become. Matt Wilson is a case in point. Wilson is a celebrated drummer whose resume speaks for itself. Wilson made his bones with saxophonist Dewey Redman and in Charlie Haden’s Liberation Orchestra. Along the way he has lent his sideman talent as the first call drummer for piano trios led by luminaries like Denny Zeitlin, Bill Mays and Paul Bley. In the various iterations of his own groups, usually quartets, Wilson has consistently shown the ability to create a steady stream of creative music that spans the gamut from hard-bop to the avant-guarde, with his music always retaining an inherent sense of joy, a Wilson trademark. 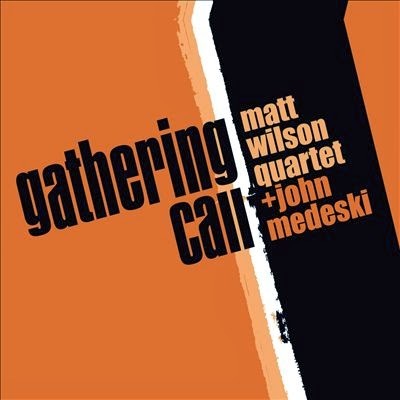 On Wilson’s latest, Gathering Call, the prolific drummer has enlisted the cornetist Kirk Knuffke, the reed player Jeff Lederer, bassist Chris Lightcap and guest pianist John Medseki. The music can be traditional big band with a contemporary twist as in the opener Duke Ellington’s “Main Stem” where Knuffke can sound like Lee Morgan and Lederer takes on a sound not unlike Gene Ammons big boss tenor to great effect. The music can be playfully raucous like on Wilson’s three compositions “Some Assembly Required,”, “Gathering Call” or “How Ya Going?” Wilson is a practitioner of the art of rhythmic chicanery where he uses various sounds and stick techniques to create a cacophony of clicks, bangs and splashes all brilliantly timed and masterfully in tune to the music. The iconic saxophonist Lee Konitz, who has played with Wilson, was quoted saying " I don't think I've ever heard him play an unmusical hit on the drums and cymbals." All the while Wilson deftly interjects just the right amount of humor into his music. The music can embrace old style swing like on Duke Ellington’s rarely played “You Dirty Dog” where Knuffke plays with polished style in contrast to Lederer’s salty tenor solo, played with an exceptionally gut bucket brashness, taking the music to another level. Or as on Charlie Rouse’s wonderful “Pumkin Delight”, the music is evocative of the Blue Note hard bop hey days. The music can also be beautiful, like on Wilson’s shimmering “Dancing Waters,” where bassist Lightcap is featured on some impressionistic playing or on Butch Warren’s hopeful “Barack Obama,” where John Medeski’s piano layers a cascading shower of notes and Lederer warm clarinet tones mesh synchronously with Knuffke’s moving cornet. The music can be delicate and uplifting like on Wilson’s “Hope (For the Cause)” which features some subtle piano work by Medeski, showing the sensitive side to this player, often associated with his hard driving organ trio Medeski, Martin and Wood.. The music can be heartfelt and contemporary like on the beautifully rendered version of the Beyonce tune “If I Were a Boy,” a highlight of the album. The album ends with a piece of Americana, the quietly rendered duet between Wilson and Medeski on the traditional song “Juanita.” The song transports you to an age of simplicity and honesty that has its own special appeal. With so much diversity in music all expertly played, Gathering Call is another addition to Mr. Wilson’s growing joyful and creative repertoire that should be listened to and relished.